At Rocket Bicycle Studio, we're passionate about bicycles. And their people. Our mission: to help every rider experience the joy and freedom of cycling. 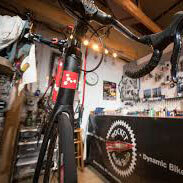 We offer full-service bicycle maintenance and repair. Your bicycle is maintained with attention and detail. We hand-pick bicycles, components, saddles, wheel-sets and accessories that are unique but affordable. We are fit fanatics and study physique using the highest-tech fitting tools available. What's more awesome than a bicycle that's got exactly the look, fit and feel that you want?